At the summit of those to secure MENA Tour cards on Tuesday sat European Tour regular Matthew Baldwin, at basecamp the mightily relieved eldest son of the Ferrari-driving, cigar-smoking, grape-loving, fine-golf connoisseur Miguel Ángel Jiménez. You can call him Junior because that’s exactly the name to which Jiménez’s 23-year-old answers. 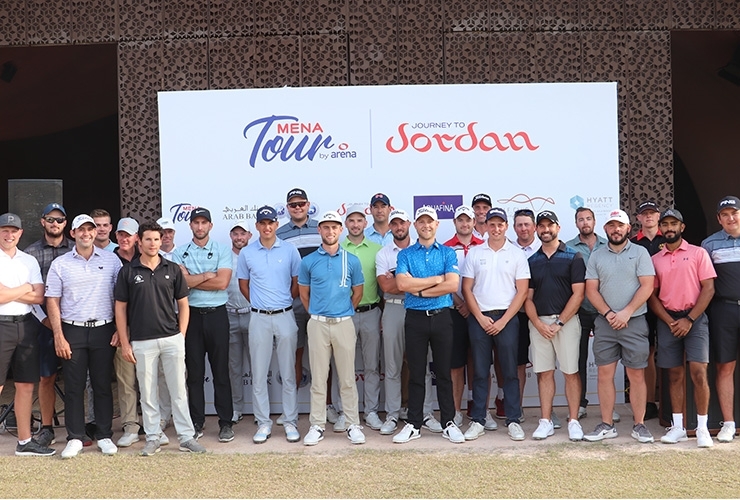 Like father, like son, Jiménez Jnr’s name certainly shone on Tuesday’s leaderboard, even if it was the last on the list of 34 players to safely advance from the second of the regional Pro-Am circuit’s two Q-Schools in Aqaba. We’re sure his proud padre, the 21-time European Tour winner and reigning Senior (British) Open champion, is enjoying a celebratory Cuban somewhere right now. 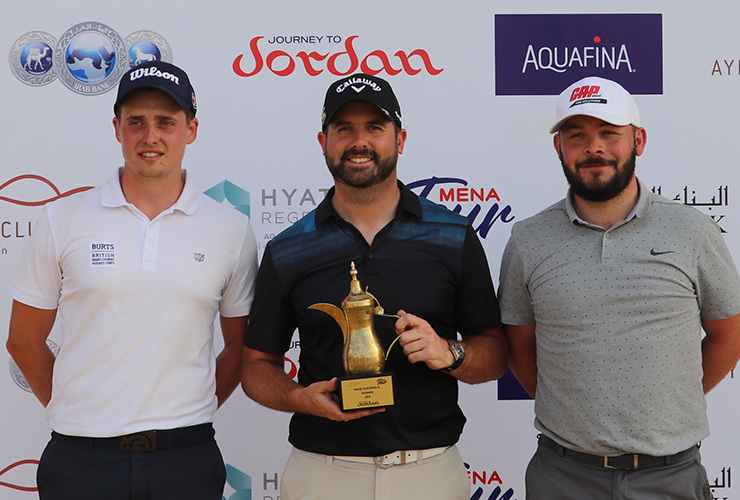 But for the champagne story from Aqaba, you needed to look somewhere in between the recognisable names to discover the completion of a remarkable comeback from Dubai-domiciled English teen Josh Hill. After signing for an opening 80 at Ayla on Sunday, he 14-year-old Trump Dubai club-member had a mountain to climb to secure his status for the 10-event “Journey to Jordan’ which begins on Friday, also at Ayla G.C. A second round 69 ensured he made the 36-hole cut Monday before a 70 eventually saw Hill finish T-27 on +3, two shots inside the snip for full playing status this season. Perhaps for dramatic effect, the England U-16 international left it late to ensure his card with birdies on the 16th and 17th on Tuesday. 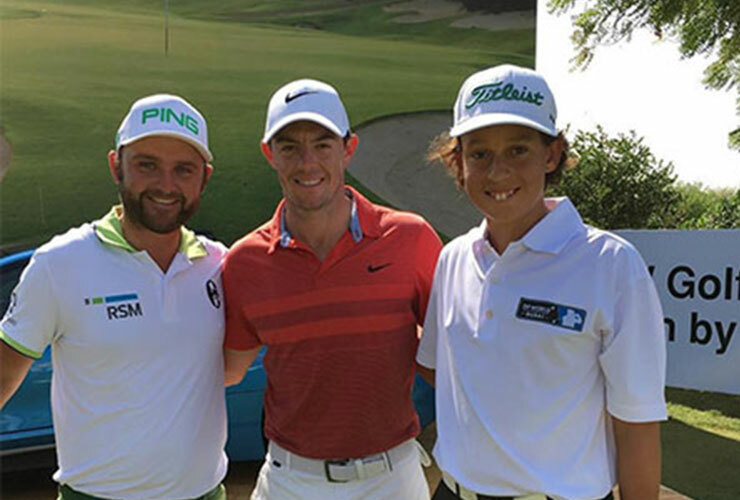 Josh Hill (right) with Andy Sullivan and Rory McIlroy in a file pic from 2018. As an amateur, Hill won’t be eligible for a single dollar of the $825,000 on offer across the MENA Tour’s 10 event season. which starts (on Friday), resumes (the start of the ‘Autumn Swing’ in September) and climaxes (the $100,000 Tour Championship in late November) at the same Aqaba resort course. But by safely negotiating Q-School, Hill has earned a priceless opportunity to test himself against players much further up the slippery slope to elite professional golf. Players like Baldwin who won medallist honours at the category B qualifier with just one bogey in 54-holes en route to a 12-under total of 204. A closing 70 on Tuesday, including his sole blemish of the week on the par-4 5th, got the job done for Baldwin who won by two strokes from fellow Englishman James Allan. Scot Conor O’Neil was third a stroke further back. Baldwin shapes as an early favourite for the tour’s $100,000, 72-hole season-opener starting back at Ayla G.C. on Friday. For the record, Jiménez Jnr carded rounds of 71-72-78 for a 221, +5 aggregate. Hill was the only amateur to secure a card from category B. Swede Oliver Jacobssen and Australia Max Duffy were the players left most disappointed after missing out on playing privileges by a solitary stroke. Full scores and category B qualifiers can be found here.